We were all looking at a House Wren working a stump when I glanced down to see a rotten log crawling with termites. Nice. I was hopeful that a good sized mixed flock of (preferably) warblers would come to scoop them up. 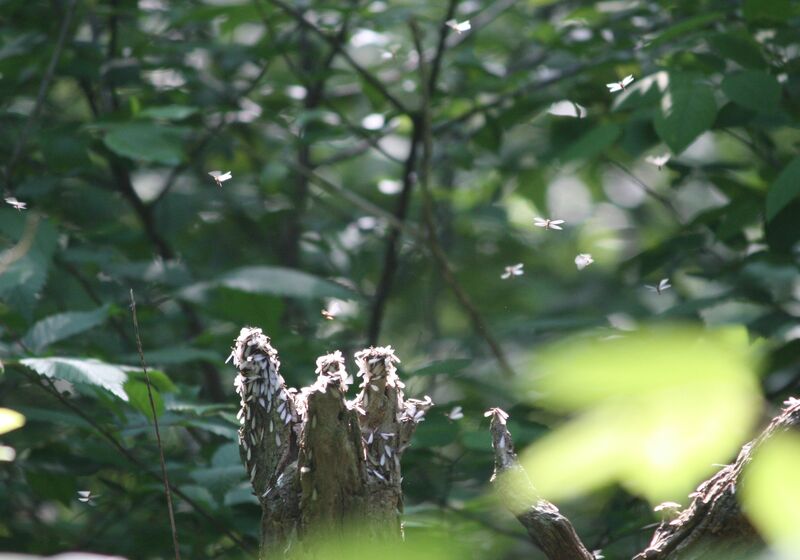 The termites milled about then one by one took off, lifting into the air, glittering in the sunlight like fairy dust. For most, their maiden voyage was cut short when the birds came to gobble them up. 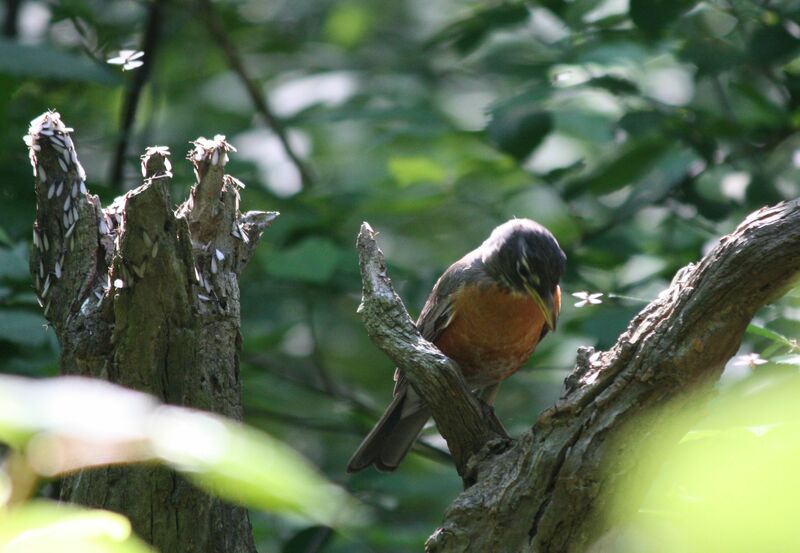 It started with the House Wren, then the White-throated Sparrows, and Robins got in the act. A Northern Parula showed up and so did a Veery and several Hermit Thrushes. 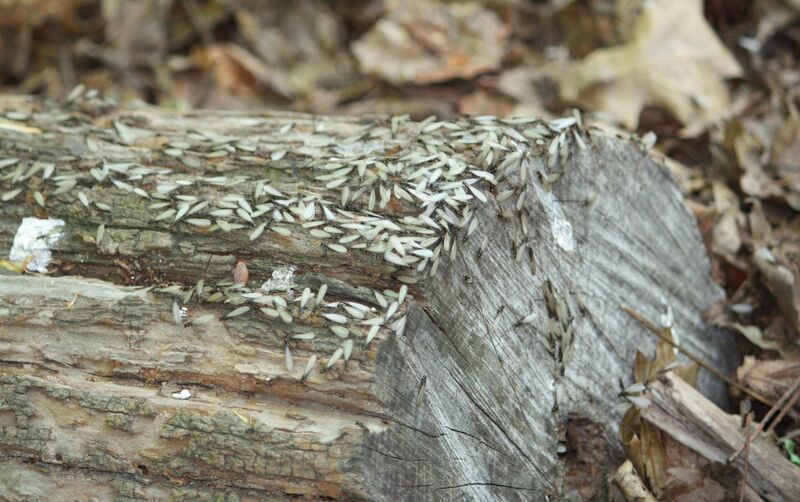 Many logs and stumps were crawling with termites in the heat of the day. It is the time of year, if you seen one, keep watch, the birds will come. With a view of the Panama Canal and the surrounding forest canopy, the Canopy Tower is an incredible place to stand in the early morning light. I climbed the narrow steps to pop my head above the hatch to see the vista open before me. As I walked in wonder around the roof, a flicker of movement caught my eye in a cecropia tree. There, facing east, as if waiting for the sun’s rays to dazzle the eye, were 2 Golden-hooded Tanagers. Nice. I continued my walk around the huge yellow dome with a jig in my step. Both Turkey and Black Vultures were swirling around at eye level. Three Red-lored Parrots landed in a clump of leaves and disappeared. A Keel-billed Toucan clacked in a tree across the way. Each direction had new trees to scan. I made the turn on my route around the dome when a flash of blue zipped into a cecropia tree. I stared in disbelief. My first lifer in Panama was not a little nondescript something, something, but…Holy Crap… a Blue Continga. I’ll tell you more about all of this tomorrow. Right now the rain is letting up and there are birds to see. Mrs. H. was going about her business but keeping close to the Mister after such a hard migration. The usual rigg-raff was in the neighborhood of course, but that was to be expected in NJ. What she had not expected, afer all off this time, was a blip in her martial bliss. And she most certainly did not expect it to come from Mister H’s roving eye. When a beautiful alluring Oldsquaw started hanging around; she paid her no heed. She was gorgeous, it’s true, but Mrs. H. knew what Mister H did not. Ducks that completely changed their look in winter were not to be trusted. She had often wondered what they were hiding from. Why the disguise? She snorted to herself; with that ridiculous long tail, it wasn’t even much of a disguise. She watched the Oldsquaw out of the corner of her eye. A tiny voice murmured in her head. “Pale ducks have more fun.” The first tendril of jealousy wrapped around her heart. Then to her horror, she noticed Mr. H, actually looking at the pale beauty too. She had thought that Mister H only had eyes for her. Her opinion of the entire Oldsquaw species changed in an instant. How dare that hussy try to intrude! Mrs. H. flew into a rage. After all she had done for him: the long flight; the nest building; bringing up the ducklings by herself. How dare he look at another female. What to Mr. H. had only been an idle glance, had tightened the tendril of jealousy of his mate. Mr. H. had seen a side of her that he had not known existed. He hastily reassured the Mrs. that she alone reigned in his affections. She had the dark beauty that he preferred and he vowed to himself that even in the secret recesses of his heart he would never think of her as dowdy again. The Oldsquaw flew off once the fighting started. She had merely been separated from her clan after a particularly long dive. Tranquility restored; the H’s paddled off resume fishing. Drive along any back road in winter and you will flush birds up from the sides of the road where they are eating grit. Most often they are Juncos and Sparrows, but I always stop and look if I can, ever hopeful that there be something else in those mixed flocks. (I got my life Vesper Sparrow that way in Michigan.) On my last trip through the snowy countryside, I saw lots of small brown birds but as I crept up to them they would fly just a little further ahead or flush into the weeds. Finally I was able to ID White-throated, White-crowned, Song, Savannah, and Juncos picking along on both sides of the road. I truly am fond of Sparrows. Ooooo, lookee. It’s an American Tree Sparrow. What a great first bird of 2009. It is not a rariety by any means but I only see them in the depths of winter. One showed up at the nyger feeder during the first big storm (remember that 17 incher) a week or so ago; then disappeared. And here it is again when the fridgid arctic air pushed our high today to 4F. 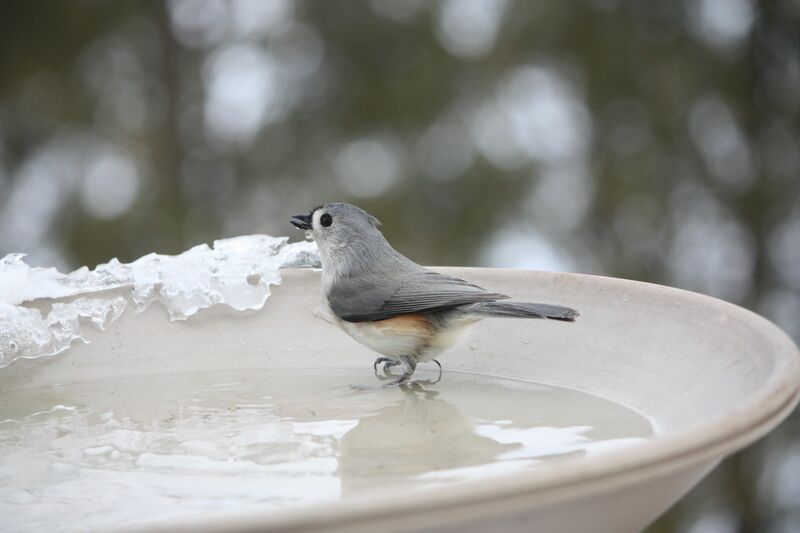 It does not come to the heated bird bath for a drink, but like the Chickadees can eat snow for the liquid. I saw both birds eating snow today. My resident backyard Chickadee flock drinks from the heated bird bath. So, does that mean the snow-eaters are migrants from further north? Interesting. Have you seen birds eat snow? Anytime you go birding in Albuquerque you need to include the Rio Grande Nature Center State Park in your circuit. It is close to the downtown and offers a view of a wetland in an otherwise water-starved landscape. The Visitor’s Center has cement wings with peep holes that extend from the main building giving a view of the main pond and a glass-walled observation room that provides up-close-and-personal looks at the waterfowl. There are also various trails around the pond and down to the river. The main attraction the day I was there was the ducks. Lots and lots of ducks. There were American Wigeons, Gadwalls, Wood Ducks, Northern Shovelers, Ring-necked Ducks, Mallards, Lesser Scaup, Coots, Redheads and Canada Geese on the pond and Sandhill Cranes in the field on the drive up. BUT, the craziest thing was a coot that was struggling to eat something in the water. We all watched it fascinated. It was whitish and floating. I thought it was plastic until one of the naturalists came in and told us it was a bullfrog, long-dead, killed by a muskrat. The coot had been working it for a while. Um, slimy putrid frog-legs would not be my choice, but then I’m not a coot.